I have been asking a few questions in here lately, as I'm beggining my journey as a Sharepoint Online 'developer' for my new internship. I have created a custom approval workflow, and I wanted to collect a comment from the person who will Approve or Reject the task assigned to him/her by the WF. I have tried adding a new column called Approver Comment, a text column with multiple lines (non-obligatory). The workflow works, but only until the point where the "Assign task to..." tries to execute. It simply doesn't, but it does if I remove the column I made. I tried creating a new content type with Workflow Task(Sharepoint 2013) as parent, and with it's own comment column, but the same has happened. The task was never assigned after the inclusion of the column, I would like to know why is it and how can I get it to work. And please don't recommend using OOTB workflows. If the 'Wait for task completion' checkbox is selected on the task itself, the workflow will pause execution at that point until the task has been completed (approved/rejected). Be sure to select your custom content type in the Outcome Options > Task content type dropdown. Be sure to associate your workflow with the Tasks list that contains your custom content type. You might find the following article helpful: http://www.jenniferannmason.com/Blog/Post/251/-Office365-and--SharePoint-2013--Creating-Custom-Workflow-Tasks. Not the answer you're looking for? Browse other questions tagged sharepoint-online workflow content-type column or ask your own question. How to add workflow tasks to a currently running workflow? 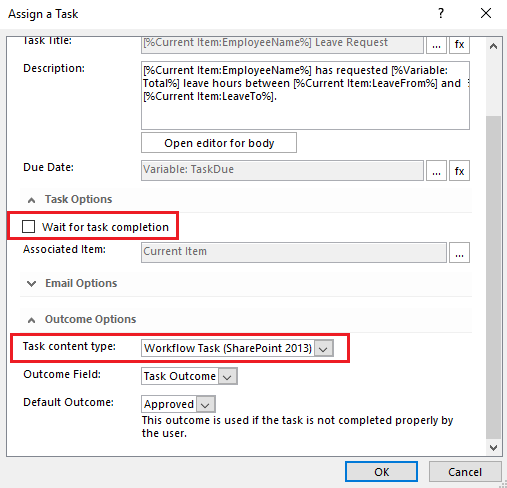 How do I assign a custom task type in a SharePoint 2013 Online workflow?